My yarn stash, as always, overfloweth. After another year of spinzilla, my bin of handspun was getting rather tight! I have always sold the majority of my handspun yarns, but over the last few years there have been a number of small experimental skeins, special purchased fibers, and the leftover small skeins from a big batch that's been divvied up. And so, I have decided to create a blanket using up all my handspun bits! 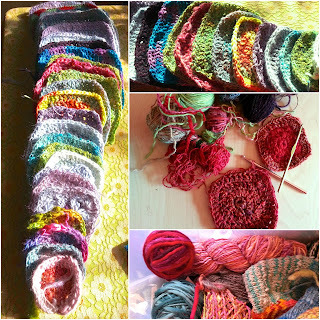 Some are a true mini-skein or a wee ball, some are simply an orphaned skein with no other plans. All of them are being crocheted into the biggest square they will make (Well, no bigger than 12" or so, extras become little squares.) and will become a blanket! I've got two sizes of hook on hand, and anything too small gets doubled up to make a good thick fabric.